Lincolnshire County Council is preparing to submit a planning application in May for the East-West relief road in Lincoln. The road would transform the section of the High Street near the busy crossing (pictured) into a pedestrian-only zone, with traffic in the area re-routed. The scheme, which would relieve traffic across the city and increase the High Street pedestrian area, would bid for £20 million of funding in September. 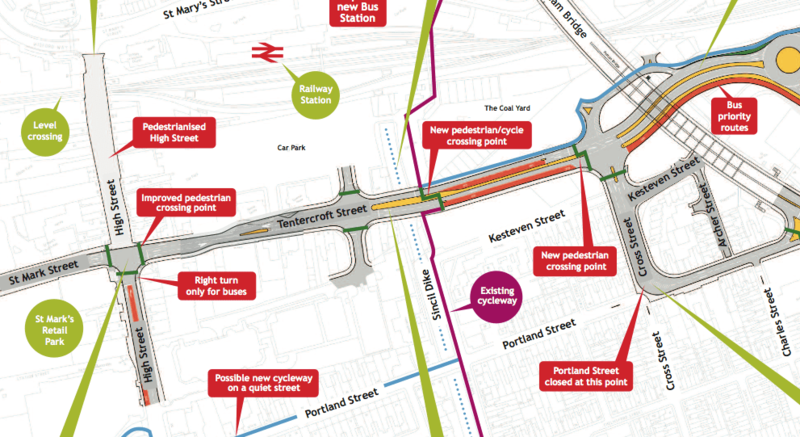 Under the plans, Tentercroft Street would be extended to Cross Street so traffic can move around the crossing, instead of causing high volume deadlocks. Around 20 businesses in the area will have to sell their premises to accommodate the new route and will be compensated by the County Council. A meeting will take place on Tuesday, March 22, at The Green Room in Tentercroft Street at 7.30pm to discuss the relief road proposals. With £450,000 of European funds, the County Council already began building new office units on the site of the former coal yard at the bottom of Tentercroft Street. The offices will provide 6,000sq ft of space, divided into seven offices. The development is independent of progress with the East-West link road, though the schemes are meant to complement each other. If approved, phase one works of the project would only commence in 2013. Though also in 2013, Network Rail is expected to extend the time the barriers at the High Street level crossing are down, to accommodate more freight traffic. Currently down around 20 minutes of every hour, the barriers would be down for up to 40 minutes per hour, creating further traffic disruptions. Network Rail previously said it is not willing to pay towards the relief road, but would like to see the High Street crossing permanently closed. A bridge or underway would be built instead, yet the cost of this is unknown, and not included in the £20 million cost of the East-West link road project.